The biggest National Drink Days Calendar scoured from all sources online. Let’s assume when something is designated as “National” it’s a U.S. thing – but everyone is invited! Days marked with an asterisk (*) are a handful of days that aren’t technically drink days but could (and should) be transformed into cocktail days. If you know of any more, leave a comment below and it will be added to the list. 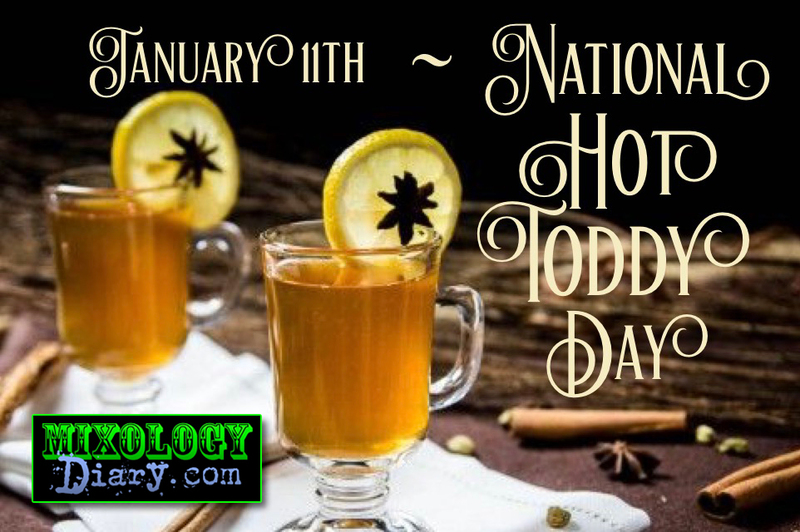 Subscribe to my Twitter feed for reminders of upcoming National Drink Days. Make it a Long Island Iced Tea! Have a classic – the Orange Blossom Cocktail! Black Tot Day (31 July 1970) is the name given to the last day on which the Royal Navy issued sailors with a daily rum ration (the daily tot). How about a Salty Dog, Greyhound, or Hair of the Dog? So many cocktails require lemon juice. Get squeezing! Just toss out the fruit and have a brandy! Who needs an excuse to make a Caramel Apple Martini? you left out national “give a bum-a- drink day”, june 6 and recognized officially at 6pm. How did this national day even start? I have found no sources on the internet for this. National Margarita day was today…February 22nd and falls on February 22nd every year! Thanks rb, Sue & Ed. I’ve made sure your suggestions are on the calendar. Can’t find an official Wine Cooler Day anywhere on the web. Perhaps you have a link?? Did find: 80’s Wine Cooler Day is July 19, 2015..
November 7, National Gin Day. Looked it up and added it as the second Saturday in June, which is the most common date I found. June 14 National Bourbon Day. Seems that there are TWO! April 9 and October 19. Why choose? I added both. Great list, but here are a couple more…. Thank you, Jace! I see YOU originated some of these. CHEERS! And thanks for getting us some days in May. National Bourbon Day is June 14, 2014. Why is this list so incomplete?? Thanks! Thanks to people like you, it’s getting better all the time. I couldn’t verify this one but I’ll take your word for it! If St Patrick’s Day made the cut, Cinco de Mayo should too. May 9th is Moscato Day!! Got it – Third Saturday in May. Thanks! Had it but I’ve cleaned up the display so everything shows up. Thanks. When is national Manhattan drink day? I haven’t found one but June 14 is National Bourbon Day. we need a manhattan day! Why is July 7 not national 7 and 7 day? It only makes sense. I don’t know how these things get started, but I think you may be on to something there. Maybe check in with Jace Shoemaker-Galloway, The “Queen of Holidays” above for some guidance. Get it out there! Added it! Sorry we just missed it! Thanks. Whew! I realized a lot of the days weren’t showing because of database issues. ALL resolved and the whole year is listed above!!! If you have any more, let me know. Thanks for the tip, Maria! Mezcal Day is added! Where is National Drink Wine Day? Feb 18th. My favorite day of the year. Could I request a national St. Germaine day? And national Jell-O Shot day! Added! No confusion, indeed. Wouldn’t want to skip a wine day. yeah, we need a international manhattan day! Added! A sad day, indeed. July 31st Black Tot day. The day the Royal Navy issued its last daily Rum ration. Why isn’t there s national hurricane day??? When is national tequila day? All of your national days seem to be off by one day. Apparently not maintaining the site any longer? Every-Buddy Needs a Drink Day! How can one of the longest beer drinking celebration not be on the list!?! Oktoberfest – September 16th to October 3rd. Thank you for pointing out the obvious miss! Apparently. March 27th is International Whisk(e)y Day. We DO see International Whiskey Day here, and that’s good enough for us! National Drink with Your Buddy Day! Hate to turn anyone away, but we couldn’t find a reference to ‘National Drink with Your Buddy Day’ anywhere. Could it be a special day just for you, Buddy? Found a Malbec Day for April 17 if you’re interested in adding it. Love your site, it’s my go-to. Added – Salut, Dinero, y Amor! I don’t have any days to add just wanted to thank you for compiling this list. Cheers! Thanks so much for the note!!! I have always been told that National Brandy Day is June 22nd. I cannot find anything to back this up though…can you help? Can’t find anything either, but in the search found National Brandy Alexander Day – January 31st! 1 part Jack Daniels, 2 parts Apple schnapps, 1 part Sweet and sour, 1 part Club soda. Mix in glass on the rocks. recipe courtesy of Jack Daniels, obviously. December is Egg Nog Month and the 4th week is Egg Nog Week as well as a National Egg Nog Day on Dec. 24th! Adding them to the list! So far, we’ve got three entire months worth dedicated to drinks: October-Applejack & Oktoberfest, December: Eggnog. Thanks for a super organized website. It’s my go-to for my own website. Cheers! Any idea how the Give a Bum a Drink Day came about? Anything you can offer would be awesome! when is national goon day? Thank you for the note. Fixed! Thank you very much ! Fixed ! !